Home » Blog » Europe » Norway » Norway in a Nutshell: What Is It, and Should You Do It? 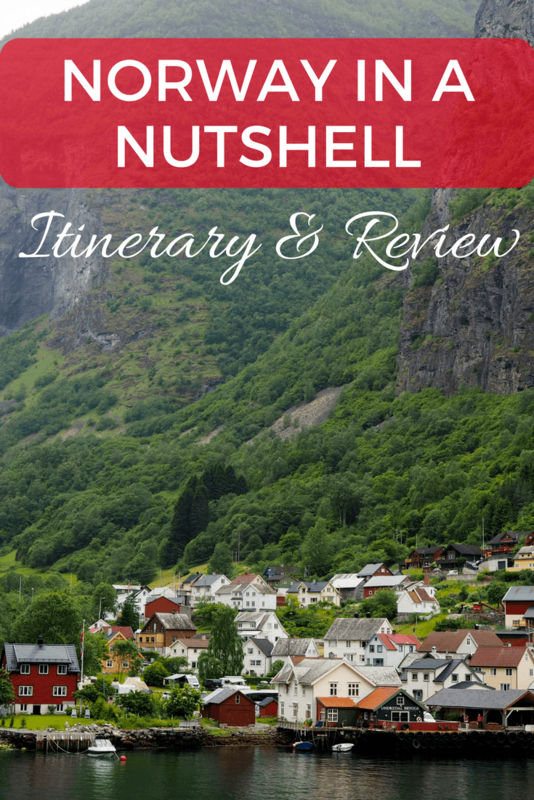 Even before my love affair with Norway officially began in 2015, I had heard of the famous “Norway in a Nutshell” tour. It's so named because it allows you to experience the best of Norway – waterfalls, mountains, fjords, and more – all in one journey, often in just one day. The “original” Norway in a Nutshell route runs between the cities of Oslo and Bergen, so when I finally decided to visit Bergen for the first time in 2017, I knew I wanted to get there by taking this tour. You start in either Oslo or Bergen (I started in Oslo), and then cross the width of Norway on a series of trains, boats, and buses. Along the way you travel through Norway's UNESCO-recognized fjord and mountain scenery, and also take a trip on one of Europe’s top scenic railroads. I'll be honest: Doing the Norway in a Nutshell tour in one day makes for a really long (12+ hours) day. But damn is it an epic day. Here's a look at what Norway in a Nutshell actually is, as well as some tips for taking this journey yourself. So, the first thing to know about the Norway in a Nutshell “tour” is that it isn't really a tour at all in the usual sense of the word. There's no guide with a little colored paddle to follow – you're more or less responsible for getting yourself from Point A to Point B. When you book your tour (with , who coordinate the original tour and make everything easy to book in one nice, neat package), you'll be sent a series of tickets that are good for the various forms of transport that you'll take on your journey. You'll also get a printed itinerary with departure times and other need-to-know information about each leg of your trip. Norway in a Nutshell is essentially an independent tour, but without the stress of booking everything separately on your own. You'll head west from Norway's capital on what's known as the Bergen Railway (you can actually take the same train all the way to Bergen, but of course the point of Norway in a Nutshell is to see way more than you could from just the one train). This leg of the trip takes about 4.5 hours, and the scenery really is best during the second half of the ride (meaning if you want to nap for the first half, you don't have to worry about missing much). The landscape doesn't start to look like this until you get closer to Myrdal. You'll get off the train in the little mountain town of Myrdal, and have maybe half an hour before getting on the next train. There's a decent cafe here, so if you want a coffee or snack, now is a good time to grab one. 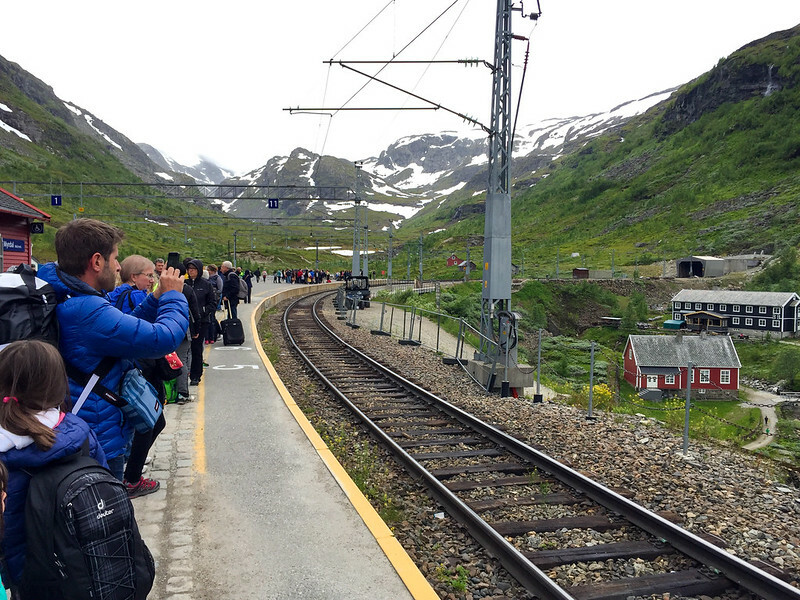 People waiting in Myrdal for the next train. 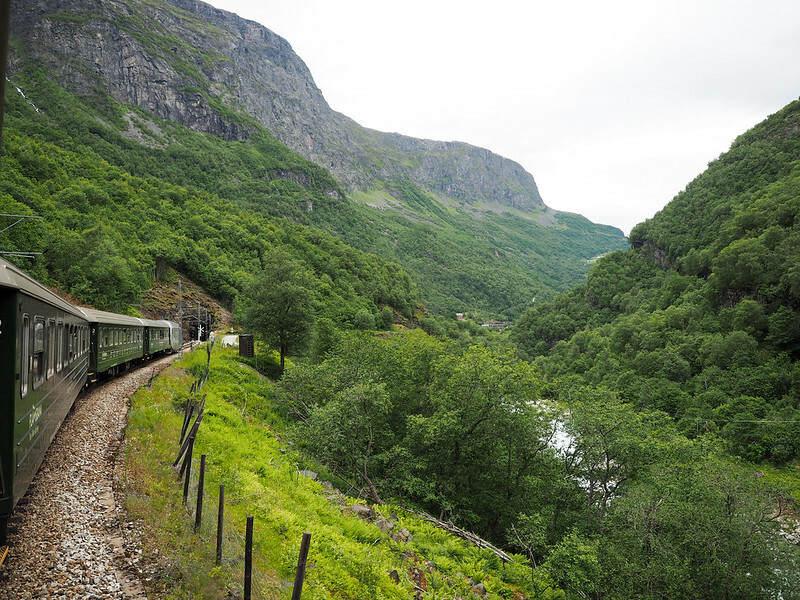 The next leg is on the famous Flåm Railway, a 20.2-kilometer-long branch of the Bergen Line. This train ride is often named one of the most beautiful train journeys in the world, but make sure to keep your eyes open because it only lasts for about 45 minutes! The ride goes through some spectacular scenery. Prepare for mountains, valleys, waterfalls, and tiny little villages. You'll also pass through 20 different tunnels as you make your way down 867 meters in elevation, so just be aware that you won't have views for the entire 45 minutes. You'll stop at Kjosfossen to watch some waterfall maidens dance. Just try to sit next to a window that can be opened so you don't have to take photos through glass. Riding the historic Flåm Railway. Once arriving in Flåm, you'll have half an hour or so to explore the little port town before embarking on a ferry for the next portion of the trip. 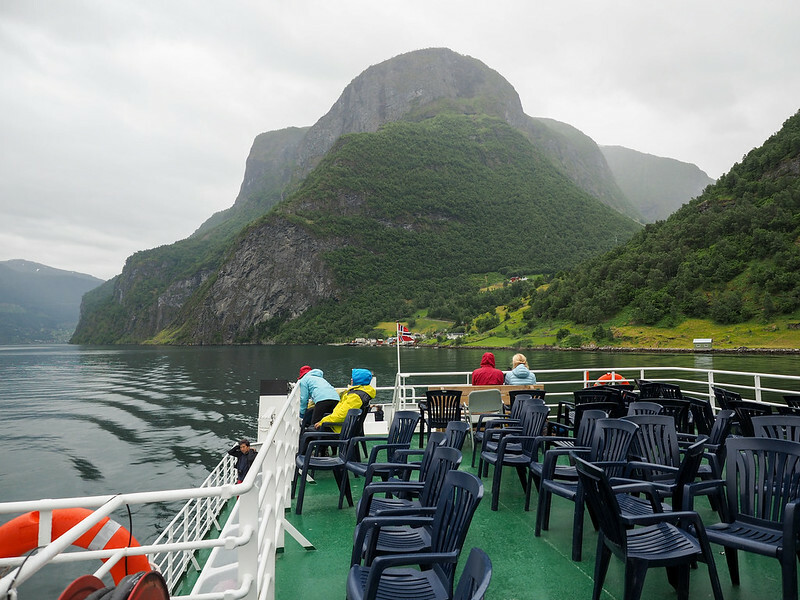 This part – the cruise on Aurlandsfjord and Nærøyfjord – was my absolute favorite part of the day. Even though I've cruised Norwegian fjords before, and even though it was a bit rainy, the scenery in this part of Norway was just INCREDIBLE. The village of Undredal on the Aurlandsfjord. Nærøyfjorden (one of the narrowest fjords in Europe that also appears on UNESCO's World Heritage List) was especially beautiful with ridiculously tall and steep mountains. The village of Bakka on the Nærøyfjord. The cruise lasts about two hours, and there's indoor seating and a cafe serving snacks and hot drinks in case you hit some rain like I did. You'll disembark the ferry in Gudvangen, and then board a bus that will take you to the town of Voss. 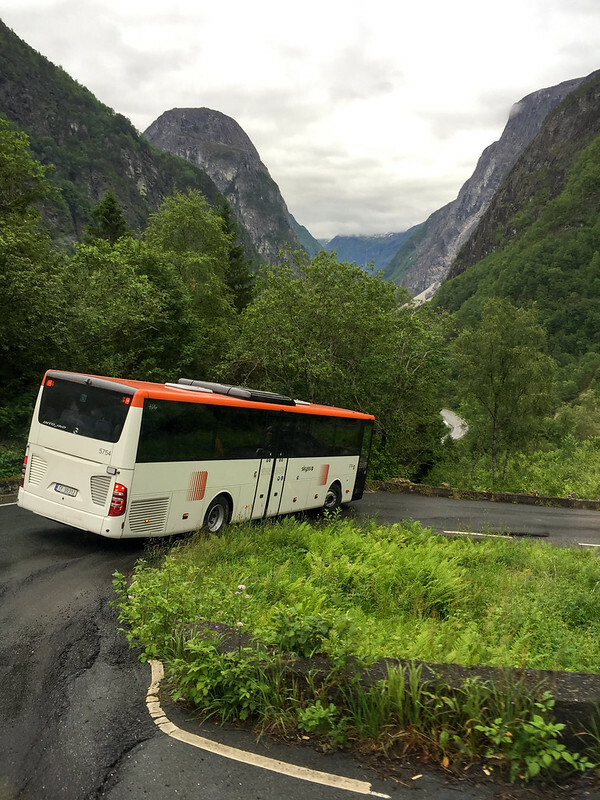 During the summer months (May-September), this bus ride will include a ride along Stalheimskleiva, one of Northern Europe's steepest roads with 13 hairpin turns. Going around a turn on Stalheimskleiva. If you want to be super impressed by a bus driver, you'll want to ride a bus down this road. It's SO steep, and those turns are SO tight. I didn't expect this part of the journey to be so thrilling, but it really was! 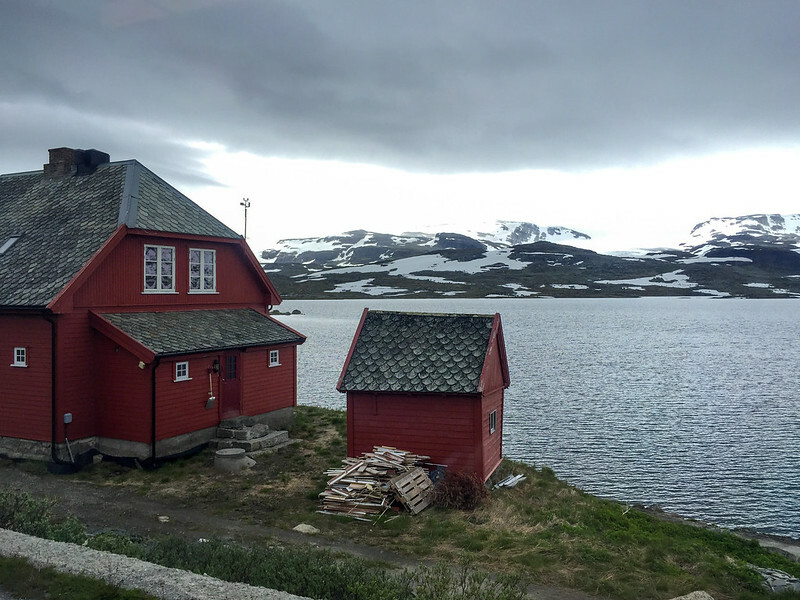 The last leg of your Norway in a Nutshell journey will be another train ride, this time from Voss to Bergen. You won't see any better scenery on this ride than you already have, so feel free to just sit back and relax for about an hour and 20 minutes. What time of year can I go? The good news is that this is a year-round attraction! You can book Norway in a Nutshell in any season. Make sure to bring rain gear and a warm hat! Can I do this in one day? Like I mentioned above, you can do Norway in a Nutshell in one day if you do a one-way trip (like Oslo to Bergen or vice versa). It's a long day – I started at 8:25 a.m. and didn't arrive in Bergen until a little after 9 p.m. – but definitely doable. I used this tour as my way to travel from Oslo to Bergen. You can also do round-trip tours (popular from Bergen), or customize one to spend more time in some of the cities along the way. If you want to extend your Norway in a Nutshell trip, you totally can. Popular places to spend a night include Myrdal (popular with hikers), Flåm, and Voss. If you stay overnight in Flåm, you can also add on activities like a fjord safari, kayaking, or even snowshoeing during the winter months. Check out , or . You can also overnight in Bergen or Oslo if you're doing a round-trip journey; both cities have tons of things to do. In Oslo, I recommend the , which is close to the central train station. In Bergen, the is ranked #1 on TripAdvisor, or the is right at the Bergen train station. If you do this trip one-way like I did, you may be wondering what the heck you'll do with your luggage. Thankfully, you can do Norway in a Nutshell with luggage in tow pretty easily – you're just responsible for it yourself. 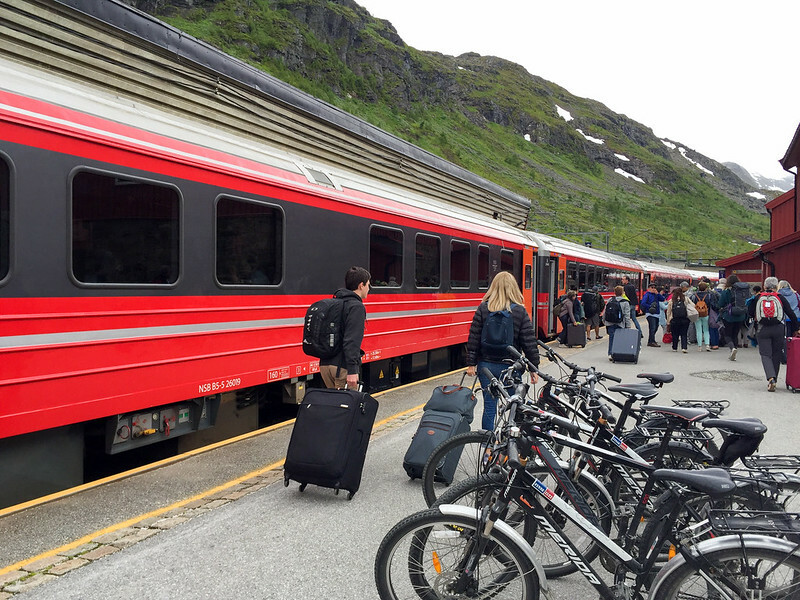 People taking luggage off the train in Myrdal. 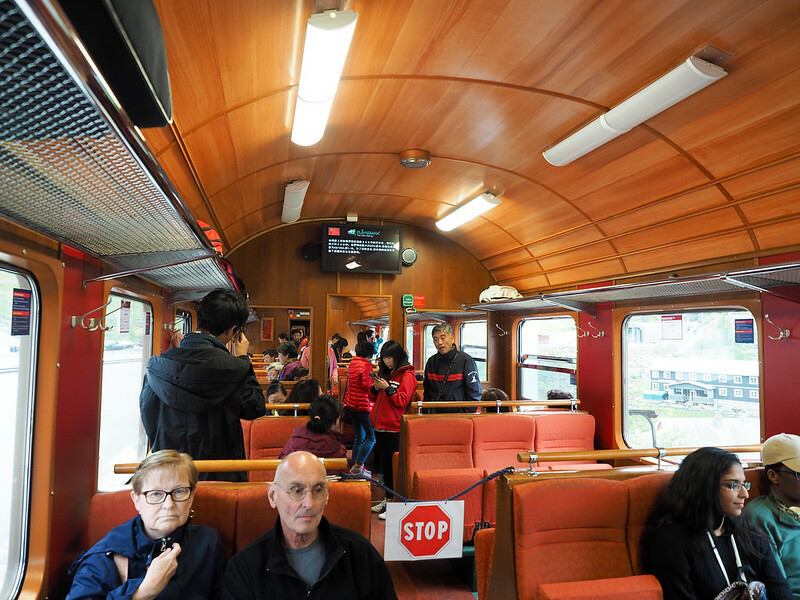 On the Bergen Railway trains, you'll find luggage racks at the end of every car (and also shelves above your seat for smaller bags). On the Flåm Railway, porters will load your luggage into a separate car if you want – just look out for the luggage gathering area in Myrdal. And there are of course designated places for luggage on both the bus and boat, too. If you're doing a round-trip itinerary, I would suggest just bringing a small overnight bag with you and leaving your main luggage at your hotel in either Bergen or Oslo if possible. A round-trip from Bergen (which includes everything except the train ride to Oslo) is actually the best deal when it comes to Norway in a Nutshell. That round-trip journeys start at 1440 NOK ($180 USD). A one-way trip like I did from Oslo to Bergen starts at 1890 NOK (roughly $240 USD). This is the biggest question people ask about Norway in a Nutshell. Since it's not technically a tour, and since you could totally book every single leg of this journey independently, you don't *have* to book the whole package if you don't want to. Booking thing separately might even save you a bit of money. But, if I've learned anything from my years of travel, it's that sometimes it's worth paying a little extra for convenience (and in this case the convenience is booking everything in just a few clicks on ‘ website). I definitely think Norway in a Nutshell is worth it, even if you only have one day to spend on it like I did. What do you think? Would you want to do the Norway in the Nutshell tour? *Note: Thanks to Visit Norway and Fjord Tours for hosting me and organizing this part of my trip. As always, though, all opinions are 100% my own. Oh yes, the landscapes always make my job super easy in Norway! Yes it made for a long day, and I think I would recommend spreading it over two days if possible. But it was great! I did this way back in 2002…unfortunately for some reason that I can’t remember the Flam railway wasn’t working so we had to bus it. And at some point the bus broke down…. so we rolled into Bergen very very late. I still enjoyed it and would love to do it again someday. I spent the following day in Bergen which was enjoyable and then took an overnight train back to Oslo. Ah sorry to hear you didn’t get to ride the Flam Railway! I’m sure you still saw epic scenery, though – Norway is just insane! Looks like such a fun and gorgeous adventure! Definitely! If you ever do it, make sure to have full camera batteries! For sure! I mean, why fly when you can see all this great scenery along the way instead? Norway in a nutshell looks like a good tour for someone who’s visiting Norway for the first time. It’s an easy way to absorb the essence of the country and then revisit the places that you like, and besides, you can book each leg of your journey separately, which is a benefit. Yes it’s a great overview – and also perfect for anyone who doesn’t feel comfortable renting a car and driving in a foreign country! I have some good friends living in Bergen and they’ve been asking me to come visit for a few years now. The place is amazing and I think I’ll finally cross it off my wishlist this fall! And, overall, Norway is an awesome country, from a lot of points of view! Bergen is a great city! Just be sure to pack your raincoat, as the weather can be rather wet! My partner and I did the Norway in a Nutshell tour this past March. We started in Bergen, after the overnight train trip however, rather than Oslo to save a day for sightseeing. The best part was everything was taken care of for you; everyone was helpful to make sure you got on the correct train and bus. We encountered rain, snow, and absolutely gorgeous sunny weather while touring the fjords on the boat. Breathtaking and etheral geography. It eas probably THE best part of our trip. It shouldn’t be a question of should you do take the “Norway in a Nutshell tour”. The real question is: why would you not? So glad to hear that you had a great experience too, Mary! I think it would be difficult to not be wowed by these parts of Norway! I was just looking at ways to get from Bergen to Oslo not too long ago. This is a great option that I had not come across. It is possible to book all this on your own though, I’m assuming. But the convenience of having someone else put it all together is probably worth it. Yes you can definitely book it all on your own since you’re using all public trains, boats, etc. But it definitely was easier to have someone else just do it all for me! I absolutely enjoyed reading this post! I’ve heard a lot about Norway in a Nutshell, and your post has really broken it down. I especially like the fact that you don’t have to use a car, as I don’t drive, and haven’t for close to 20 years! Eek! Ah yes, this is an excellent way to see a lot of Norway without having to rent a car! I thought about doing this when I visited Bergen last year, but felt like it was too many connections to really enjoy much of anything. I felt like I got to see pretty fabulous scenery without all the time in transit by doing a 4 hour fjord cruise from Bergen. I’m thinking of returning to Scandinavia next year (never been to Norway), and this looks very tempting! I love Norway so much! And this tour is a great way to see a lot in a short amount of time. It’s even more beautiful in real life! Hopefully you’ll get to go a see it someday! I live in Norway and I´ve never heard about this tour before I read this post. Now I really want to try it myself haha. I’ve never been to Flåm but I would love to go there. It’s really weird reading a travel guide about your own country, but it makes me see things from a different angle and appreciate the places around me. I even lived by one of the most stunning fjords for 3 years and I did not appreciate it until I came back a few years after. Why didn’t I see it then? I think it happens to all of us – we tend to take for granted what’s right on our doorstep. You should definitely explore more of Norway! It’s such a beautiful place and I always love visiting. You literally just opened up a world to me! I’m frantically clicking on all the different activities. I love the idea of this! I’m planning a trip with my mum to Norway in February, and this sounds perfect! Sounds like it would be a great option for you! Loved the dramatic scenery and variety of the countryside while on Norway in a Nutshell–absolutely worthwhile! This wild ride was at the start of a 3-week solo backpacking trip to Norway in 2001. I doubt the scenery has changed since then, tho’ the trains have an updated look. I broke up my Nutshell ride by staying overnight in Aurland, a few miles from Flam. The next day I took the Flam Railway partway back up–halfway to Myrdal–and hiked back down on the little, paved road. It was a beautiful spring day in May and there were no people about (in cars or on foot/bicycle) for the first 2 hours–only sheep. Lots of sheep–lambs, ewes, rams–all white like the wispy clouds in the blue sky above me. They appeared in drifts as I hiked on down, here and there, like spring flowers next to the mossy banks of the rushing stream. Then, two-thirds of the way down I saw a person–a shepherd driving a big flock down the road from their unseen pasture. And, of course, the first car showed up a minute later so I could laugh while they waited and waited for the sheep to be nudged off the road. That hike is still my favorite travel memory. You never know when or where Your favorite travel moment may be. Get out there and find it. Happy trails to you. That sounds like an amazing hike! And such a nice travel memory. Do you have to plan ahead if you are going to make an overnight stop or not? Or are the tickets flexible and you can play it by ear? Yes, that’s something you’ll want to plan ahead for, especially if you’re going to book everything as a package! If you’re going to book tickets individually, there are still some trains that require seat reservations, so you still need to plan ahead a bit. I have a similar question to one asked above. Can the trains be boarded anytime? We are taking the tour from Oslo to Bergen (one-way), but don’t want to do the whole tour in one long day. Can we get ourselves to Flam the first night and then do the rest of the tour the second day? Are trains running all of the time? Or are you locked into certain ticket/departure times? Basically, we want to know how flexible the trains are. Let’s say that we want to spend a bit more time in one particular spot, is that possible? Or would another train not come along for us? You do need seat reservations for most of the trains, meaning you do need to book specific times. But if you know you want to stay overnight in Flam, you can definitely do that and just book the rest of the trip for the following day. Great article! What time of year did you go? I’m thinking of doing the exact same one way route this April. Can i do the above in the early Nov ? my concern is the weather. You can do this trip year-round, but there’s always a chance of rain in this part of Norway! Thank you Akatuki. This is now on my bucket list for when I visit Iceland and the countries of the Baltic Sea. 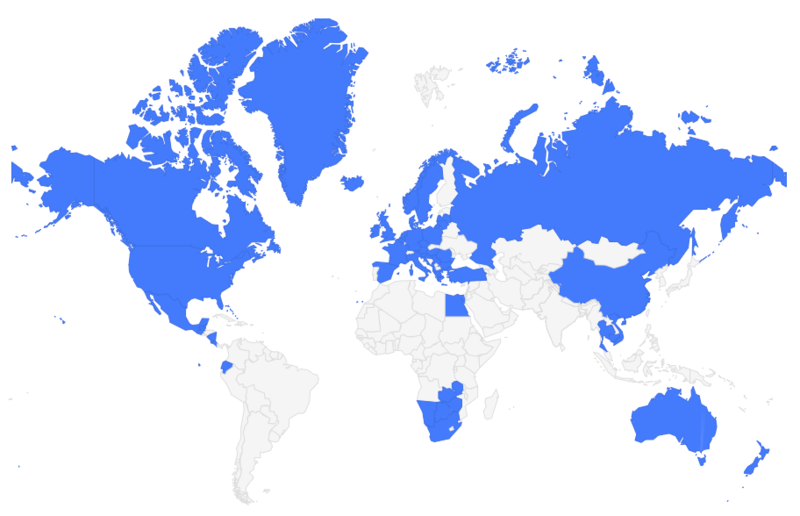 Do you know anything about fjordtravel? I couldn’t find any customer reviews on them. Hi Vida! I’m afraid I don’t know anything about that company – my NIN tour was booked through Fjord Tours. It’s likely to be quite cool in those months, and probably wet in Bergen (it’s almost always wet in Bergen, though!). The tourist season is usually in the summer in Norway, so you definitely would not be contending with huge crowds in autumn. You didn’t mention what the overnight accommodation was like on the train? We are two seniors and couldn’t deal with bunk beds. Could you answer this please. Will have to do it in the one day because of time commitments. Also not sure how to book it online? Thank you. We have decided to do the one day after all and stay in Bergen overnight. Your blog about the trip makes it sound like a must do! I am doing NIAN next month and am super excited however … I have a terrible fear of heights. Will the bus ride portion be difficult for me? As someone who doesn’t have a fear of heights, it’s difficult to say since I don’t think I truly grasp what that fear feels like! But the only portion of the bus ride that might be “scary” is when you’re going down the switchbacks – maybe don’t sit next to a window for that part, and I think you’ll be okay! There is a company I found which picks your luggage up in Oslo and delivers it to your hotel in Bergen. Goinh to use them as we are seniors and don’t really want the hassle of the luggage wrestling. Hoping they will work out. I forget how I found them it might be a link on the Nutshell site. Did the Nutshell from Oslo to Bergen in one day. Just a note to say that they have a concierge service that picked up our bags at the hotel at 6.30 am and delivered them to our hotel in Bergen. I think it was about $ 50 and well worth it as we are Sneniors,though very mobile, it just helped a lot. Loved it all even though it was a rainy day on the boat, each part gave us a real feel for the country. Bergen was very, very expensive. Arrived late at the hotel and Two soups cost us £ 30, each I think it was. Good to know that you had a good experience using that concierge service! And yes, Bergen is quite expensive – though so is the rest of Norway! Hi Marvin. I’m not sure what the procedure is if you decide to book once you’re there. If you book in advance, they can mail you all your tickets or documentation, or arrange for you to pick up the packet elsewhere. Your best bet would be to Fjord Tours directly. I don’t work for them, so I can’t really answer any booking questions. Most people choose to overnight in Flam if they want to break up the trip into two days. As for Oslo, I don’t think it should be too busy in April. But all of Norway is pricey, so yes, you’ll need to be prepared for that! Sorry, this is a travel blog and I don’t have any affiliation with Fjord Norway, nor do I sell tours. You’ll need to them directly with any booking questions.